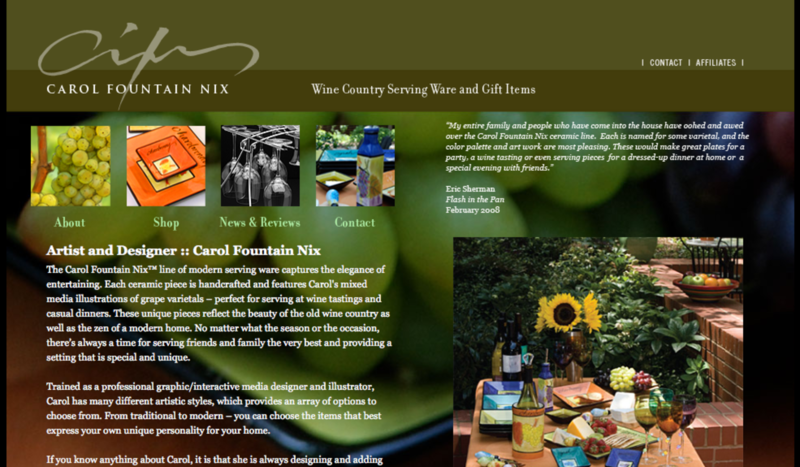 Project: Here at SlabMedia, We were asked to create a website to allow customers to learn about Carol Fountain Nix recent news updates, discover what Carol Fountain Nix is, as well as shop products sold at the store. Summary: The Carol Fountain Nix line of modern servingware captures the elegance of entertaining. Each ceramic piece is handcrafted and features Carol's mixed media illustrations of grape varietals perfect for serving at wine tastings and casual dinners. These unique pieces reflect the beauty of the old wine country as well as the zen of a modern home. No matter what the season or the occasion, theres always a time for serving friends and family the very best and providing a setting that is special and unique.